Update: Just to be clear on dates—meteors should be visible tonight, Tuesday 8/10 through the morning of Wednesday 8/11, and tomorrow night, Wednesday 8/11 through the morning of Thursday 8/12, but the height of the shower, and the nights that will see the most meteors, are Thursday 8/12 and Friday 8/13 and their associated mornings. Find a wide-open space to watch. You'll want a good view of the whole sky, even the bits near the edge. Try calling up that one guy you hooked up with who had roof access. If he doesn't pick up, leave a threatening voice message, because why not. Avoid places with a lot of light pollution. The further away from bright lights you are, the more meteors you'll be able to see. If you live in a rural area, try driving out to a field, or something. You've got to have a field somewhere near you, right? If you live in a city, consider moving. It's a buyer's market! 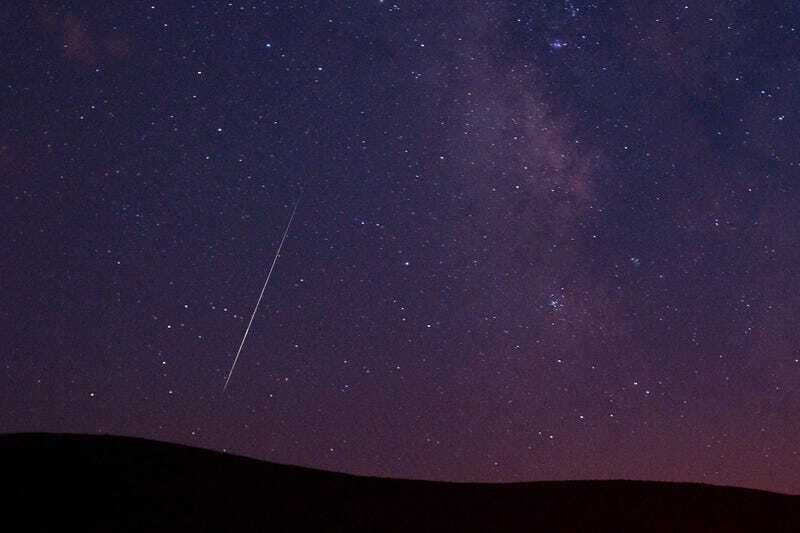 Be early—the prettiest meteors come early in the evening. Right after the sun sets, when the meteor shower is low in the sky, the meteors will streak beautifully across long portions of the sky. Be patient—the peak won't come till late. The height of the shower, when meteors will be most frequent, usually occurs between 3 a.m. and 5 a.m. your local time (depending on latitude), as the Earth moves directly into the path of the debris. So be prepared to wait! Maybe bring a book, to use as kindling for a nice fire. Invite friends. But only the good-looking ones! No, just kidding; you can invite whichever friends you want. Just remember that this is a good chance to hook up. Bring blankets. The best position to watch the shower is lying down, so you have the fullest view possible of the sky. This is also the best position to make out. Just saying. Put on bug repellent. We always forget to do this. Do some research. Did you know that the Perseids are actually debris left behind by the Swift-Tuttle comet that the Earth passes through on its orbit every year? No? Then you'll look pretty dumb when someone asks you what the lights in the sky are, won't you? Bring some beers. And obviously, we'd never suggest illegal drug use, ever, but wouldn't it be so weird if you developed glaucoma, just for this week, and your symptoms were only alleviated by marijuana? And also you bought a vaporizer? Write it down so you remember. Seriously, how often have you totally meant to stay out and watch these and then just let it completely slip your mind?